This week on Lake Okeechobee the winds after all the storms this week have been light. The lake has risen some more and the water temp has dropped to the 80’s. The water clarity is good throughout the lake with red water on the west end of the lake with all the rain we have had but there is a lot of fish in it. 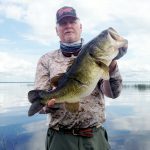 The morning bite is still the same, White swim jigs and Spinnerbaits in the morning in the Kissimmee grass. After that bite is over Flipping/Pitching every thing you see. They are pretty scattered throughout the Pencil Reeds, Cattails and Kissimmee grass. Good areas to fish are J&S, King Bar, 3rd Point, and the Lakeport area of the lake. Here is a picture of me with an 8lb Largemouth Bass that I caught this week.